Established in 2006, UK Air Testing has been at the forefront of air testing since the mandatory Building Regulation was introduced. UK Air Testing is owned by a family with 3 generations of building experience, this enables us as a company to understand our client’s needs. UK Air Testing is a member of BINDT (British Institute of Non-Destructive Testing). All tests are carried out in accordance with ATTMA (Air Tightness Testing & Measure Association) TSL1 Standards by BINDT registered engineers. The Retrotec equipment used to carry out air permeability tests is calibrated annually to UKAS standards. Our clients, including multi-national developers but also self-builders, have requested that we offer additional services to our portfolio, as they trust our competitive pricing and friendly approach to what can be a daunting compliance process. Therefore, on the right-hand side of this page you can select a variety of services from UK Air Testing, all under one roof! Over the last few years, UK Air Testing has successfully offered its customers an air sealing service which is continuing to prove very popular. UK Air Testing can act as your point of contact for Commercial Air Pressure Testing for nationwide delivery on any sized property at superb prices. 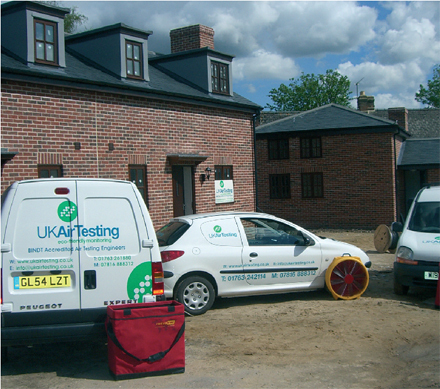 UK Air Testing takes pride in our approach to the developer and helping them to achieve targets in as many ways as we can within the guidelines of the Building Regulations. Such testing is required for new build to (a) certificate the room / system, and (b) to certify that indeed the design concentration is reached in the first instance as excessive leakage may be so great as to lose the design concentration during the release period itself.